"English 398: Fiction Workshop" has been named a finalist for the Edgar & Agatha Awards! In April 2015, B.K. Stevens debuted the blog series “The First Two Pages,” hosting craft essays by short story writers and novelists analyzing the openings of their own work. The series continued until just after her death in August 2017, and the full archive of those essays can be found at Bonnie’s website. In November 2017, the blog series relocated to my website, and the archive of this second stage of the series can be found here. 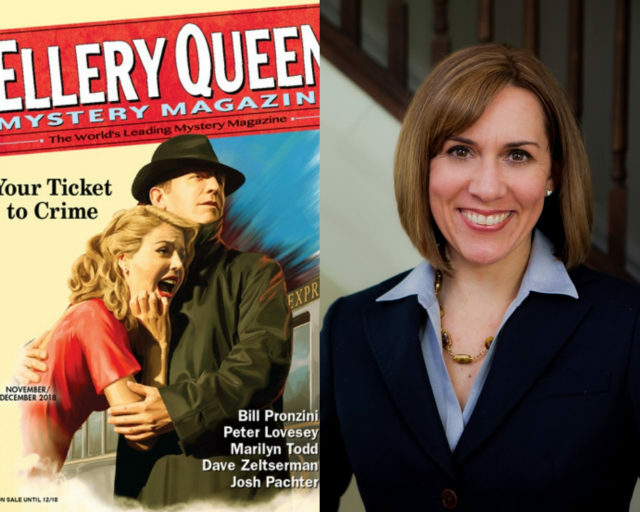 In the latest issue of Ellery Queen’s Mystery Magazine, Stacy Woodson makes her fiction debut with “Duty, Honor, Hammett” in the magazine’s Department of First Stories—joining a distinguished history of writers that includes Charles Ardai, Laura Benedict, David Dean, Brendan DuBois, Martin Edwards, Stanley Ellin, Jack Finney, Harry Kemelman, William Link & Richard Levinson, David Morrell, Nancy Pickard, and James Yaffe, among many others (the many others including yours truly too, a fact for which I’m regularly grateful). I was particularly excited about Stacy’s debut story for a number of reasons. Stacy’s a member of our local chapter of Sisters in Crime, the Chesapeake Chapter, and so we run into one another pretty regularly at events. I first met her at Malice Domestic a couple of years ago, and if memory serves, it was after a short story panel, so good to see her succeeding so well in the short story market already. And in terms of the story here—centered in part on Dashiell Hammett’s grave in Arlington Cemetery—I’m a big Hammett fan myself: our son’s name is Dashiell, and we visited the author’s grave ourselves with him a couple of years ago, so the subject matter piqued my interest as soon as Stacy told me about it. “Duty, Honor, Hammett” was the first story I read when the new EQMM arrived, and a fine story it is—as you’ll begin to understand yourself from her essay below. Stacy already has three other short stories coming out over the next couple of years—another in EQMM and two in anthologies: Malice Domestic’s Mystery Most Edible and the Chesapeake Crimes anthology Invitation to Murder. You can find out more about Stacy and her work at www.stacywoodson.com. Please use the arrows and controls at the bottom of the embedded PDF to navigate through the essay. You can also download the essay to read off-line. Hosting at House of Clues! Blast from the Past, Still Relevant Today? Sign up here for quarterly newsletters. Thursday, April 25: Edgar Awards—Yikes!